When I was a little kid and would take in a particular Disney animated feature multiple times within a very short window I always wondered what it might be like to see such characters and such worlds come to life. Real life. I never thought it would happen after the live action versions of 101 Dalmatians and its money-grubbing sequel underwhelmed (at least they did in my adolescent mind), but then again I also desperately hoped that one day movie studios might wise-up and begin building a shared universe where my favorite super heroes interacted on the big screen as well. As I've grown up and become a parent myself it seems Disney has decided to make all of my dreams come true while also giving their most iconic of animated classics updates so that they might reach wider audiences and new generations-including my daughter's. Over the past seven years or so now we've seen an uptick in the number of live-action films based on classic Disney properties. Whether they be from the respective studio that originated the tale in popular culture or not it seems many have noticed this as a way to garner solid returns-despite the brand recognition formula not always working (I liked you, Tarzan, but you cost too much). Though Disney began this recent trend by attempting to re-work properties such as Alice in Wonderland and the Sleeping Beauty story in the form of the Angelina Jolie vehicle that is Maleficent, it has been the last two live action adaptations in Cinderella and The Jungle Book that have yielded the best results in terms of quality (with all doing rather well financially). The point being, when it comes to these re-imaginings the best bet for both pleasing audiences and critics alike seems to be sticking with the source material and simply adding flourishes where might be necessary. This is one of the highlights of this latest incarnation of Beauty and the Beast as more logic and depth are applied to the characters and their plights despite the film as a whole being little more than a pound for pound remake of the Oscar nominated 1991 animated version. One would be hard-pressed to even call what director Bill Condon (Dreamgirls) has made here an interpretation, but while there isn't anything in particular that separates the film apart as being great in its own regard, it pays honorable enough homage to this reviewer's childhood memories that it would be difficult to argue with the thrills and excitement it delivered in selling such a fantastical story come to life. If, for some reason, you are not familiar with the story of Beauty and the Beast it deals in the lessons of learning to appreciate people for who they are on the inside and not how they look or how much money they have. It doles such teachings out by chronicling the events of a young, educated woman named Belle (Emma Watson) who feels trapped in the small, French village where she and her father have settled down. Her father, Maurice (Kevin Kline), is also creatively inclined as it is indicated he has a passion for drawing as well as crafting music boxes and the like that he takes to sell at the market. 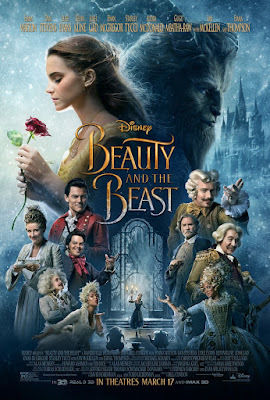 Belle has garnered the affection of town war hero Gaston (Luke Evans) who any other illiterate girl in the village would absolutely kill to be with, but the point is-Belle wants more. More than her provincial life can provide. What Belle doesn't bargain for is that something more coming in the form of a magical castle with talking silverware and decorative objects who are ruled over by an unforgiving beast. When Maurice gets lost on his journey though, and stumbles upon such a castle and is consequently taken prisoner this is exactly what that something more turns out to be as Belle comes not only to the rescue of her father, but to discover the mysteries and the magic that lie within this hidden kingdom as well as find out what role she might play in reversing such fortunes. 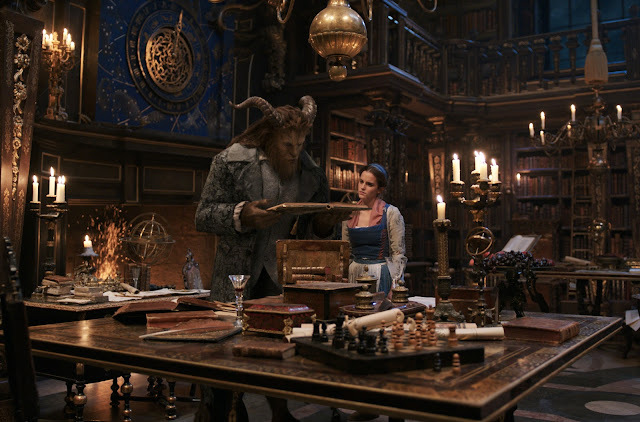 The Beast (Dan Stevens) and Belle (Emma Watson) bond over their love of books. © 2016 Disney Enterprises inc. All Rights Reserved. There is seemingly so much to discuss and yet ultimately so little when it comes to this latest incarnation of Beauty and the Beast. As this is more or less a carbon copy of that 1991 animated feature one knows what to expect walking into the movie and despite the fact that Oscar-nominated feature sets a pretty high bar it's not hard to feel mostly satisfied by what Condon, his troupe of actors, and especially those behind the scenes in various art departments deliver in this (mostly) live action version. Of course, both the most curious and appealing aspect of these live action Disney re-makes is how the actors inhabiting these iconic roles measure up to the animated creations that have been ingrained in our brains for decades now. With Beauty and the Beast we're operating in territory that is half Cinderella and half The Jungle Book as pleasant presences such as Emma Watson, Luke Evans, and Josh Gad infuse the human characters with plenty of their trademark qualities that will have fans of each of the respective players smiling and nodding in approval/recognition while the other half breathing life into the usually inanimate objects that populate the castle are curiously just giving extensions of what they might do in a fully animated film. I don't know for sure, but find it hard to believe the likes of Ewan McGregor and Ian McKellan were wearing spotted body suits and jumping around on set every day. While McGregor, McKellan, Emma Thompson, Stanley Tucci, and Gugu Mbatha-Raw are more or less enlisted to do voice work (and they're fine, though it would honestly make little difference were they replaced by any other current contemporary) it is clear that Dan Stevens, who portrays the titular Beast, was indeed wearing a spotted body suit and jumping around on set every day (and likely on stilts as well, no less). Stevens, who if you saw The Guest, are watching Legion, or even happened to catch that third Night at the Museum movie, you already know as a talented actor is unfortunately undercut by the digital effects we all thought would be the least of this films worries after last years insanely convincing The Jungle Book. Rather, the Beast here serves to undo much of the dramatic tension and what credibility there is to the already fantastical story by often times looking so funny due to the fact it looks so fabricated. There are moments, naturally, when the digital rendering of the part bison, part wolf creature is convincing and intimidating, but this is mostly when he's relegated to the shadows. Otherwise, the only time the Beast is amusing is when his attitude contradicts his look-flashing a smile for his fellow castle-dwellers who were destined to be cursed with him. Somehow still, the romance between Watson's Bell and Stevens' Beast prevails to the degree we again become wrapped up in the history surrounding the curse and the plight of breaking it. Fortunately for Disney, this was all that would matter for as long as Condon was able to successfully garner the trust of those who already adored the characters, appreciated this certain adaptation of the story, and would be primed to sing along with the songs-he would please most that would flock to see this opening weekend. 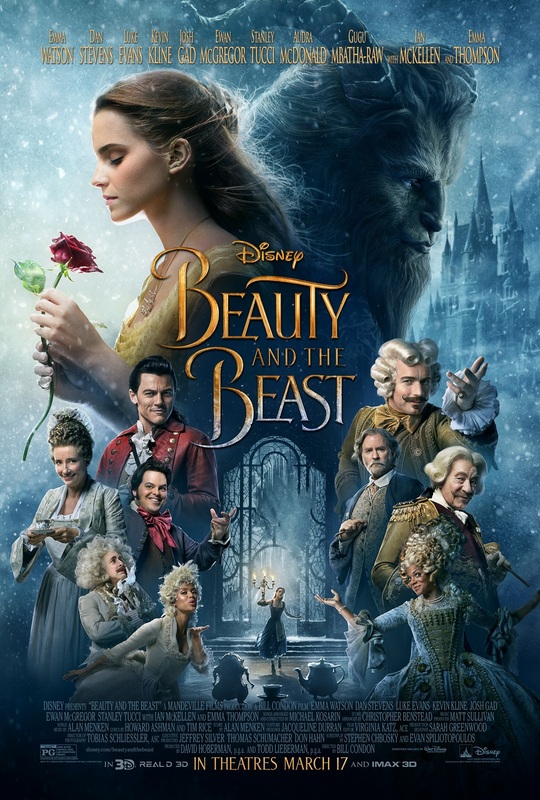 In this regard, Beauty and the Beast succeeds well enough by rendering a glossy and rather majestic version of this tale as old as time without daring to leave an impression that would last for even a fraction of such. 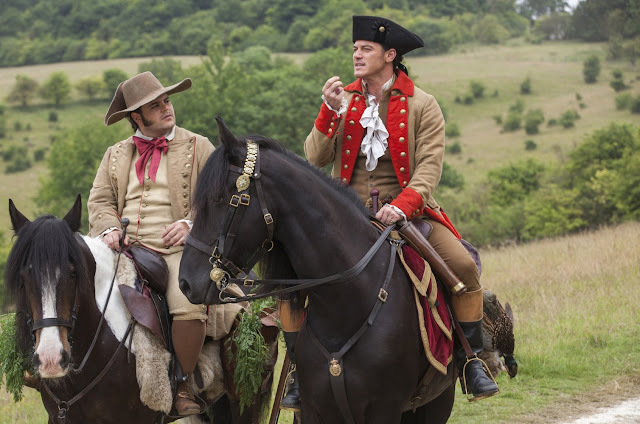 LeFou (Josh Gad) and Gaston (Luke Evans) ride into town in their introduction in Beauty and the Beast. It is in Condon's direction that we find the biggest disappointment of this update in that as far as the creativity goes it begins and ends with the aesthetic look of the film rather than the visual sense we get from Condon's camera. There is nothing done here to inspire awe beyond the sets and costumes as Condon, a director who has mainly worked in serious dramas, but has a worthy enough musical on his resume to allow us to expect more than what he's delivered here, allows much of the film to feel static. The movie might be worth a re-watch just to observe this facet alone, but never did it feel as if the camera was as energetic as the actors and this is especially glaring during some of the musical numbers. To the point that some of these more iconic songs in the Disney repertoire come out as little more than blurs of color and overpowering music that drowns out a fair portion of the actors voices is disappointing to say the least. The biggest difference from the animated version to this is, "Be Our Guest," which is a completely forgettable, fully computer animated number that has Watson almost obviously reacting to nothing in insert shots that only serve to emphasize the dissonance between the practical and the digital. This is a shame as Lumiere the candlestick's big number was a stand out among the original soundtrack that was penned by Alan Menken and the late Howard Ashman. While Menken returns to add a few new original songs most of these attempts fall flat with only the opening number of, "Belle," and the cheerful, "Gaston," proving to be productions worthy of challenging the versions produced in the original. The combination of Evans and Gad is especially key to the "fun" factor of the film with Gad's LeFou being given more of an arc that flows from beginning to end (with the whole gay thing most definitely being overblown) and a slightly new perspective being taken on the Gaston character as he's not exactly adored by everyone in the small, provincial French village as he was in the original. Evans and Gad are most clearly the most gifted of the main cast in the vocal department as well which might have something to do with our ability to enjoy and revel in their musical number more than most. Given "Belle" largely consists of extras in the village who were undoubtedly picked for their singing chops rather than their acting ones and it's easy to understand why some numbers quickly and easily rise above others. Watson, while a charming and empathetic presence, isn't the best belter in the world and it's clear her range is limited from the word go. And I adore Emma Thompson, but that doesn't make her Angela Lansbury. Watson fills the iconic yellow ball gown well though, and as mentioned before, is able to conjure up genuine care for the core relationship the plot depends on for everything else to work. Couple this with the grand visual design and the pure glee of seeing ones childhood brought to life and what we have is a serviceable if not significant piece of work.